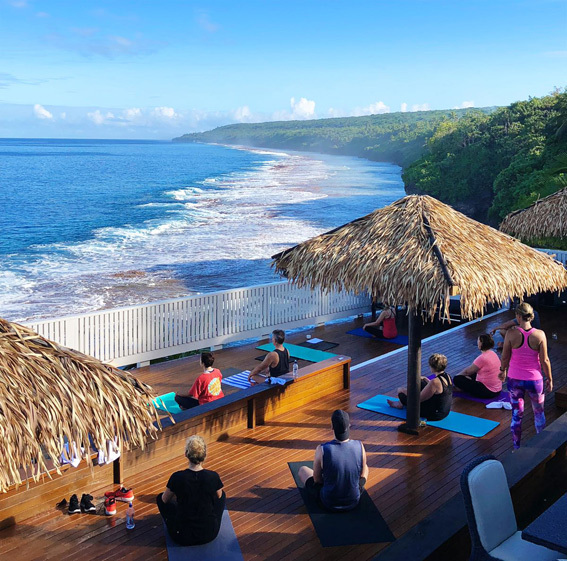 You're invited to a five-day transformational Yoga, Fitness and Adventure Retreat for girls and guys in Niue. With Wellness Retreats NZ founder and yoga teacher Melissa Carroll, holistic and integrative nutritionist Kaytee Boyd and personal trainer Paddy Flavell. Escape to paradise for a full immersion into nature, a digital detox and wellness for the mind, body and soul. Please note flights are additional. Optional snorkelling trip, diving, fishing and golf available at an additional cost. Options to extend your stay and room upgrades available. *Terms and Conditions apply. Pricing based on a minimum of 16 travellers. Mel is the founder of Wellness Retreats NZ, with a diverse background including crewing on super yachts, managing a high-end women’s surf and yoga retreat in Bali, and extensive corporate event management. She is extremely passionate about health and well-being. A personal battle with chronic fatigue was a life-changing experience and led to an immersive journey to wellness again only using natural and holistic treatments. This journey has fuelled her desire to share her story, educate, inspire and guide others on their own journey to lead healthier happier lives. Mel is certified in Vinyasa Flow and teaches at various studios around Auckland. She is also a guest teacher at lululemon and provides private yoga instruction to individuals and businesses looking to bring more wellness into their everyday life. Wellness Retreats NZ specialises in bringing together a dynamic range of New Zealand’s leading wellness professionals and brands. Retreats and events are designed to empower and educate, nurture and nourish, giving guests the knowledge and encouragement wherever they may be on their Wellness Journey, and enabling them to connect with their body, mind and soul. Kaytee is one of the pioneers in integrative nutrition in New Zealand. After graduating from Otago University with a double degree in Human Nutrition and Sport Science, as well as training in CHEK HLC II and functional exercise coaching, she has honed her skills and realised conventional medicine does not look at the whole person. A member of Nutrition Society of NZ and Australasian Integrative Medicine Association (AIMA) and the MINND Foundation, Kaytee is a DAN practitioner working with Autism, as well as an advisor for the Breast Cancer Network to support the education and prevention of breast cancer, and currently runs workshops on treating all types of cancer. Kaytee is the eternal student, with a scholarship to ACNEM (Academy of Chemical and Environmental Medicine) to further her study this year. Her passion for learning is based on how she can better help her clients, and her infectious enthusiasm, and honest and uncomplicated approach to her clients' challenges makes her clinical consultations and corporate seminars enjoyable, motivating and empowering. A professional athlete herself, Kaytee has competed for New Zealand in BMX, mountain biking, and road cycling and is a World Cup Gold Medallist in track cycling, and brings an in-depth understanding of what it takes for optimal performance, both physically and mentally. She speaks regularly for corporate and educational organisations and runs retreats in New Zealand and internationally. Paddy is one of New Zealand’s leading personal trainers. He’s been with Les Mills Auckland for 16 years, which has seen him win personal trainer of the year five times. Paddy’s background as a representative rugby player means he’s perfectly suited to help his clients achieve the upper limits of their personal goals. But beyond, that Paddy also works extensively with groups of teenagers, children and major Kiwi companies to help them better understand the value of fit and healthy employees. Having a diverse mix of clients in terms of ages and gender, means Paddy is always considerate of not pushing people too far, training should be fun as well as rewarding. Paddy’s passion for his clients and their own life stories, is what makes him one of New Zealand’s most sort after trainers. He’s also happily married and is the proud father of two really cool kids! He’s a living, breathing example of having a great life balance. He also comes with a bigger than life smile! Adventure… Fitness… Niue. Sound like you?